Summer seems like a distant memory already, doesn’t it? With Halloween been and gone, we are galloping towards Christmas and the cold winter season. Most organisations are fully switching over their HVAC (heating, ventilation, air conditioning) systems from air conditioning to heating, if they haven’t already, and more than a few are still switching between the two as the weather fluctuates between colder spells, chilly mornings and evenings, and slightly warmer but much more humid days. If you are worried about making that switch or have been putting it off thinking it may be a bit of a hassle, we are here to help with some advice on how to do it safely and efficiently. Fully turn off your air conditioning unit. Protect your unit’s external parts by wrapping them up against the cold and wet with tarpaulin or housing them in box units if possible. This will also prevent any ice build-up or debris from leaves and dirt blowing about in the winter winds. Now it’s time to turn on your heating units. Ideally you want to do this before it gets too cold so that you can deal with any potential problems that may have cropped up after a few months of not operating. It is also not unusual for a fleeting smell to occur. This is due to settled dust on your furnace unit over the summer, so it is advisable to open windows and doors to provide good ventilation. This should disappear after a few minutes; if it does not, then call in the professionals for a full check. Turn the air conditioning off and allow the system to cool down before you do anything else. Once it has completed its cycle, power down the unit fully and wait for 5-10 minutes. What this does is it allows the refrigerant pressure to drop to its starting point. Giving it a chance to cool down will reduce the risk of blowing a fuse or tripping a breaker which happens if you increase the electricity demand suddenly. Now switch to heating mode and turn the unit back on. 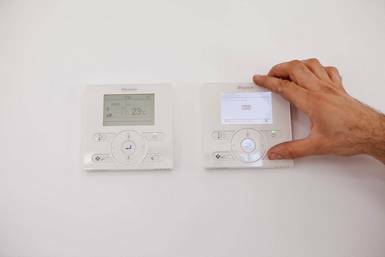 Make sure that the temperature difference on your thermostat is not too big to start with. Placing heavy demands on your HVAC unit will lead to less efficient working, so it is better to start with a lower temperature and increase it as the unit gets fully up to speed. If you are switching more frequently between the two, do make sure that you follow the steps above, but also keep in mind that there will be a slightly higher demand on your system. It is important to keep on top of your six-monthly maintenance services to ensure the unit is in good working order year round, in both heating and cooling modes. for a chat or to make an appointment.